Only ten more days until this summer's adventures begin! Yippie ki yay! 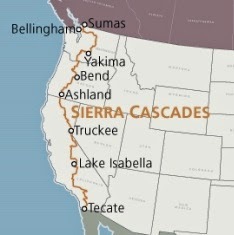 The first adventure is a two-month trip along the Sierra-Cascade bicycle route. The route parallels the famed Pacific Crest Trail, runs through both the Sierra Nevada and Cascade mountain ranges, and stretches 2300+ miles from border-to-border. Some of the highlights along the route include visits to Kings Canyon, Sequoia, and Yosemite National Parks, Lake Tahoe, and Crater Lake. In order to optimize for weather conditions, I'll be riding the route from south to north. Starting in the south early in the season allows for more moderate temperatures in the southern California deserts. In addition, starting in the south early in the season allows the snow in the mountain passes a few more weeks to melt. I'll be flying from Seattle down to San Diego to start the ride. Shirley, my bicycle, will be taking Amtrak down to southern California. Shirley will get a head start by a few days. Compared to trips in the past, I've done considerably less planning for this trip. I've acquired the maps for the trip, I've made plans to meet up with a friend in Warner Springs, and I've made plans to meet up with my brother and his girlfriend in Yosemite for a few days. Other than that, I'm looking forward to taking the trip day-by-day. After all, less planning means more adventure! Oh, and I'll have a riding partner for this trip! More about my riding partner in the next post. Don't keep us hanging too long, Sarah! I love living vicariously through you and your adventures with Shirley! Jill was in Yosemite for a few days last year, her first camping trip! She loved it! Sarah jealous as hell! This will be a great ride, looking forward to the pictures! Nice talking with you and sharing stories. I hope I will be able to join you on your tour north in June!